Generic approach - not limited to a special kind of system or platform - XML and relational database. High Volume Processing - Supports resources of unlimited size. Multithreaded - Can run multithreaded, making use of multi-core systems. Optimized - Database access is highly optimized, supporting persistence of several thousand rows per second. Data - supports single and multi-field constraints e.g. generating consistent values for a person's gender, salutation and first name. Validate generated data - Data will be generated according to the constraints definitions. If the tested application uses secret knowledge for input validation, a custom validator may be plugged in to filter out inadequate data sets, e.g. for validating addresses against a postal database. Dynamic data creation or access for stress test applications (planned). Command line invocation for continuous integration (planned). Providing an initial database setup for application deployment (planned). Providing and ensuring consistent data for unit tests (planned). extensibility by custom generators : A clear component contract for generators provides for easy implementation of custom generators and clean life cycle and resource management. internationalization : Generated data can be converted with different formats (like time values) or different languages (like salutations or titles). dataset concept : Data can be categorized and grouped hierarchically (e.g. cities of a state, country or continent). Customizable - accepts input in multiple formats from multiple sources : Specifying a data model is easy. A multitude of generator mechanisms is provided, like file or database import, regular expressions generators, sample lists, distribution functions and different input formats. Import of complex data (planned): Import of entites (or -better- entity graphs) from databases and files. 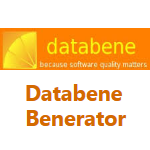 offers powerful randomization options and is extendable by custom ones. Supports grouping of data into hierarchical data sets. data sets may overlap and form several parallel types of hierarchy. Existing data can be imported and anonymized by overwriting certain attributes with generated data.